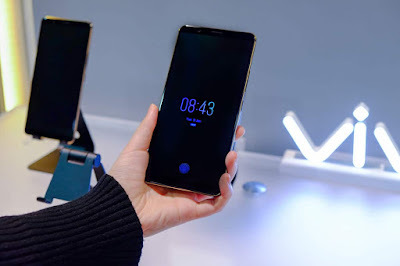 Vivo at the CES 2018 it showed off world’s first ready-to-produce in-display fingerprint scanning smartphone that uses an optical fingerprint sensor from Synaptics. This lets users unlock their smartphone through one-touch fingerprint scanning directly on the smartphone display. This doesn’t require a physical button for the fingerprint sensor and allows a true full-screen display and an integrated unibody design. Commenting on the same, Alex Feng, Senior Vice President of Vivo, said: With our efforts in extensive consumer research and long-term R&D investment, Vivo is well positioned to pioneer the development of fingerprint scanning technology. We first presented a prototype of our fingerprint scanning solution at MWC Shanghai 2017 based on an ultrasonic sensor, and have remained committed to realizing our vision for future smartphones. Vivo’s first in-display fingerprint scanning smartphone will be announced in early 2018.The Phone Showcased is Vivo X20 Series Phone.